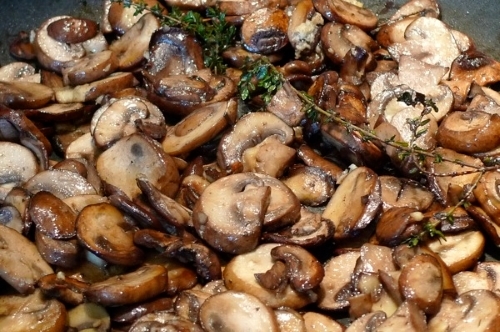 Sauteed Mushrooms can be made with a wide variety of mushrooms but for this recipe I simply use white button mushrooms. Serve this vegetable dish as a side with a nice meat, poultry or fish or eat it all by itself. Either way your in for a treat. White button mushrooms are the common type that you will most likely find in supermarkets. You can also use a mixture of baby Portobello, shitake and oyster mushrooms for a more exotic and flavorful dish. Most of the time when I prepare this Sauteed Mushrooms recipe I’ll add some shallots, onions and a little red wine then toss them over a nice t-bone steak. Every so often I’ll actually serve them as a side. Remove the garlic from the pan. Add the mushroom and sauté for around 5 minutes. In a small bowl mash the anchovies with a little melted butter. Add a little red wine at this poin if you feel like it. Toss in the parsley and the lemon juice.